I'm happy to bring you the first in a series of blog posts on Authors With Cats. Yes, you'll meet some amazing authors...but, most importantly, you'll meet their cats! Here you'll meet Winnie, the cat who lives with author Karen Sargent. Winnie is also the name of MY cat. As it just so happens, both Karen's Winnie and my Winnie are black cats with white paws, so these girls just might be soul sisters. Second, she is my daughter's cat, not mine. But last fall my daughter moved to college, leaving her one-person cat without a person. Somehow I became a cat's person; therefore, I'm an author with a cat. Her name is Winnie. There's nothing especially special about Winnie. She reinforces every cat stereotype that exists. Our home, our family, in fact, the entire world was created for her existence, so she thinks. But that's okay. I'm starting to agree with her. When my daughter moved to college, Winnie moved from her favorite pillow in my daughter's room to the top of the sofa above the cushion where I sit when I write. She pretends to clean herself or nap, but I suspect she's actually reading over my shoulder. Occasionally, she meows her disapproval, but I haven't learned to speak cat yet, so she's not a very dependable editor. Sometimes I move from the sofa and write at the kitchen table. Winnie is not allowed on the table, has never been allowed on the table, but lately...she perches on the kitchen table next to my laptop. She likes to watch the cursor move across the screen when I write. Sometimes she tries to help me, but she doesn't realize four paws walking across the keyboard isn't actually writing—and she's a terrible speller. So, I'm an author with a cat. Who'd have thought that a little black ball of fuzz abandoned at my front door would one day make my nest feel less empty? She's become the object of my affection and my therapy when I need a distraction from my laptop. And sometimes, when she feels like it, I get to pet her. 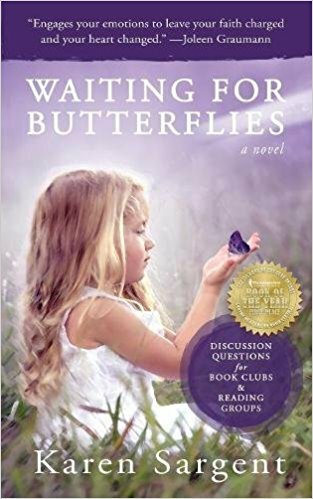 Karen Sargent is the author of Waiting for Butterflies, the 2017 IAN Book of the Year. Visit her at: karensargentbooks.com. You can find Waiting For Butterflies on Amazon , Barnes & Noble, and at other fine booksellers!